The best thing about being a kid is that every new experience is so much more fun than we, as adults get to experience. The reverse, though, is that nothing seems to satisfy our curiosity and our need to go through new experiences. That is in a nut shell why you will eventually buy a scooter for your kid and that is also why, sooner or later you will need to buy him or her an electric scooter. Of course, the first thing to be understood about these things is that they can go quite fast and they will undoubtedly be a first test for your child’s ability to take mature decisions. We are not saying that you would endanger their life by buying an electric scooter, but you should make sure that your kids can handle some of the more powerful scooters we are going to feature here before you actually buy them. So this is how we have set up this article: we are going to start with a list of the top 10 best electric scooters for kids on the market in , and then we are going to give you a detailed review for each one, where we are going to tell, among other things, what age group each scooter is for and what level of maturity you should be looking for. 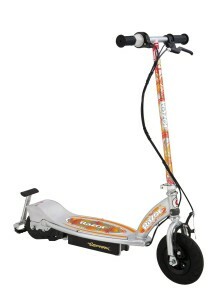 The first scooter we are going to talk about is also the most dangerous, but also the most fun and it also can be the most useful. With a top speed of 15 miles per this is not only a kids’ scooter, it can actually be a nice ride for a commuter, since you can take it with you on the train or the sub. 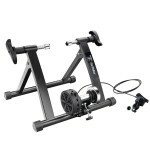 Besides the speed it has several features that we absolutely love like the fact that it uses a chain for the drive train, which guarantees many times more miles than any rubber band. 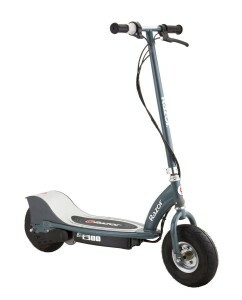 Furthermore, the Razor E300 Electric Scooter is one of the most comfortable machines you could use due to its extra thick rubber wheels. 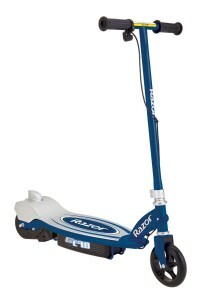 This is actually the only scooter that we could actually recommend using on anything else but concrete. Your kids can even use it to jump over various obstacles and they will still be completely safe. However, all these features do not come cheap, but we do believe that this is not only the best electric scooter for kids, but also the best value for money in this category. After we have offered so many praises to the E300, you are probably wondering why bother to continue with this list at all. 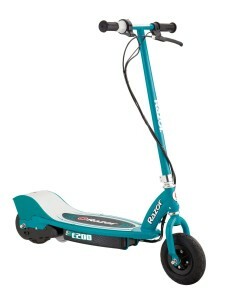 For one thing, because the E300 does not come with a detachable seat, while the Razor E200S Seated Electric Scooter does. You can still take out the seat to get a typical scooter, but it can be a very comfortable choice if your kids need this to ride to and from school. 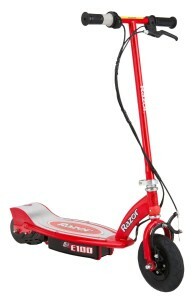 It is a somewhat slower scooter, able to reach just 12 miles per hour, but still, we would not recommend it for any child that is less than 10 years old. 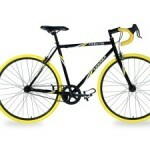 And even with 10 year olds you should make sure this is not a toy. As you can probably tell there are just 3 differences between the Razor E200 Electric Scooter and the scooter we talked about before. The S is missing, so this is the E200 while the other one is the E200S, the price is somewhat cheaper and the seat is missing. However, they both have one key feature that should make them a favorite above all other scooters that are to come: they still have a chain drive so they are a lot more resilient and reliable. The tires too, are smaller than the ones on the E300, but, at 8 inches thick, they are still plenty comfortable. Many will object that paying more than 200 bucks for a toy that may or may not catch on is not really worth it, so we are going to look at some cheaper alternatives, starting with the Razor E100. It uses a belt driven motor so it can only reach 10 miles per hour, and you will need to change that belt at some point. 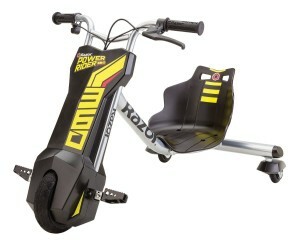 Still, this fits more the bill of a kids’ electric scooter and it is quite safe for kids as young as 7 or 8 years of age. It may even make for a more interesting toy since you have to push it to a speed of 3 mph before the engine actually kick in. Still, the one thing to remember is that the handlebar’s height can be adjusted for adult use, so some sort of responsibility should be expected from the child. It was actually quite difficult to choose between the E100 and the E90 because the later does have some very interesting features. It uses a chain driven motor and has a larger capacity battery that allows you to use it for about 50 minutes. 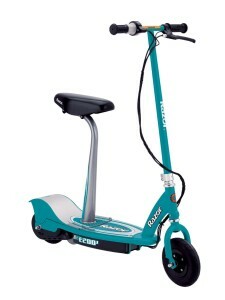 Still, it clearly not as fun as the E100 since it only reaches about 9 MPH, and that is under optimum conditions and it uses a foot operated break while all the other electric scooters we have been looking at so far actually use more efficient hand break. Of course, it could be argued that, since it does not go that fast, there is really no point in giving it a better braking system. 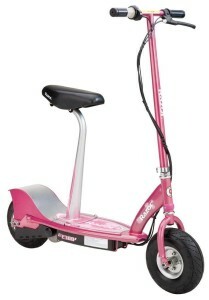 And the fact that it earned a 4.1 star rating on Amazon tells you that it is a pretty fun scooter on its own. Now that we have given you our top 5 choices we can start looking at some more interesting or curious choices for an electric scooter. 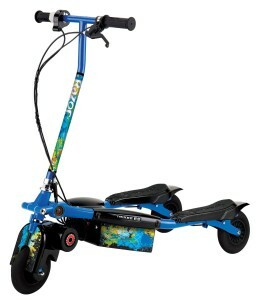 The Razor Trikke E2 Electric Scooter, for one, uses a 3 wheel base that creates the potential for much more aggressive turns and twists. It can only reach 9 MPH, but because of those tight corners, it has the potential to give you a bigger adrenaline rush than the 12 MPH scooters. And because it is going so much slower, it is still a safer alternative. We also love the fact that it comes with a hand brake, but what we don’t like is the fact that it has urethane wheels instead of rubber ones, so it is somewhat more uncomfortable. 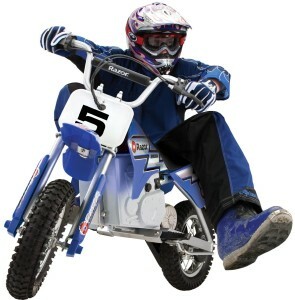 So far we have been showing you electric scooters that will be fun for your kids, so now we can take the time to introduce to you the tricycle that would have made your childhood epic, the Razor Power Rider 360 Electric Tricycle. When it comes to kids’ taste you can never know what they are going to like, but when it comes to adults, we know everyone of you will fall in love with this. It only does 9 MPH and because of the small wheels on the back it will only really work on asphalt, but it is definitely a toy that will grip the imagination of anyone who grew up with a tricycle. From the electric scooter that you have to love we can now move to the one that will be a recurrent presence in your nightmares: the Razor MX350 Dirt Rocket. This is a scooter designed for off road, that can do 12 miles per hour, and that has a very strong kick when it takes off. It is the closest your kid can get to the real racing experience on his own, and it will probably get him or her hooked on the need for speed. But, on the other hand, if your kids spend their days in front of the computer and seem to have forgotten how to have fun in the real world, this beast will yank them out of any virtual reality and get them in touch with the real adventure of life. We started our list with the E300 and you could feel how excited we were about its speed and overall performance. What we neglected to mention there, because at 15 MPH, with just a kid on board, can be quite dangerous, is that it also has a version with a seat and it is called the E300S. If you are an adult using this to commute, it is a great idea, and most of the reviewers who awarded it a 4.1 star rating on Amazon do actually use it for commuting. However if you are buying this for a child you should make sure she is tall and heavy enough not to keep this perfectly balanced. The last product on our top 10 best electric scooters for kids is a version of the E100 that has been equipped with a spark bar on the back that creates sparks when your child steps on it. It is a pretty cool feature that we are sure most kids are going to love, but that we are just not sure is worth the extra money.